Tuesday - Friday:	10am-4:30pm; First Wednesday 10am-9pm; Weekends: Noon-5pm. Closed Mondays, the month of August, & Major Holidays: Memorial Day, July 4, Labor Day, Thanksgiving Thursday & Friday, December 24 & 25, January 1. $6 adults; $5 65 & over; members, children under 18, Rutgers University students, faculty, and staff with a valid I.D. enjoy free admission. Free admission for all visitors on the first Sunday of every month. The Zimmerli Art Museum’s collection includes more than 60,000 works of art, ranging from ancient to contemporary art. The permanent collection features particularly rich holdings in 19th-century French art; Russian art from icons to the avant-garde; Soviet nonconformist art from the Dodge Collection; and American art with notable holdings of prints. In addition, small groups of antiquities, old master paintings, as well as art inspired by Japan and original illustrations for children’s books, provide representative examples of the museum’s research and teaching message at Rutgers. 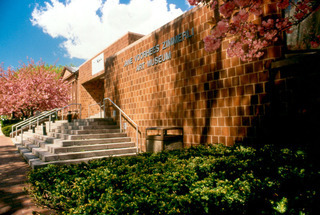 One of the largest and most distinguished university-based art museums in the nation, the Zimmerli is located on the New Brunswick campus of Rutgers, The State University of New Jersey. Established in 1766, Rutgers is America’s eighth oldest institution of higher learning and a premier public research university. Throughout the year, the Zimmerli presents world-class exhibitions with an international focus. As an educational resource serving both the University community and audiences from New Jersey and beyond, the Zimmerli offers a lively array of programs for audiences of all ages. Elementary and secondary school teachers benefit from credit-giving training programs and interactive tours for their classes. Rutgers students and community members alike enjoy the monthly Art after Hours: First Wednesdays when the Zimmerli is open until 9pm with lectures, music and dance performances, exhibition tours, poetry slams, films, performance art and more. The Zimmerli houses the Museum Store and a café.Z Café, managed by The Food Architects, serves a variety of breakfast, lunch, and snack items.Hours: Tues-Fri, 8am-4:30pm; Sat-Sun, noon-5pm; first Wed, 8am-9pm.